Jillian Michaels’ BodyShred is whole body, interval training in just 30 minutes. Each class works to burn fat, increase lean muscle, and provide better body-awareness. It’s designed to change your body—inside and out. Before you attend your first BodyShred class, here are a few helpful tips from Darci Kruse, MS, CSCS; Program Manager for Group Exercise & Active Older Adults at the Eagan Y. Can I really get a full workout in only 30 minutes? A single class will contain four of these 3-2-1 “circuits” and will end with cool down and stretching. If the workout is only 30 minutes why is it scheduled for 45? The first 10 to 15 minutes of class will be spent previewing tricky exercise combinations so that you know how to get from one move to the next without losing time or intensity. This preview time also provides a great opportunity for participants to ask questions, perfect form, and for instructors to offer modifications. Will the exercise circuits be the same every class? Your instructor will stick to the same circuits for an average of about a month, allowing you to become more effective and more efficient with the individual exercises and the transitions between them. Just when you begin to get comfortable with a set, your instructor will likely change it up! How often should I attend the BodyShred classes? You should allow for one or two full days of recovery between BodyShred classes. This time allows your muscle tissue to rebuild, helping you to get stronger. Doing exercise other than metabolic conditioning (such as cardio, light weight training, etc.) in between BodyShred days is fine and may actually alleviate some soreness. It’s working to improve the rate at which you burn calories at rest, by increasing the amount of lean muscle mass you have. With regular metabolic training like BodyShred, your body literally becomes a fat-burning machine. I’m worried I won’t be able to keep up with everyone else in the class. 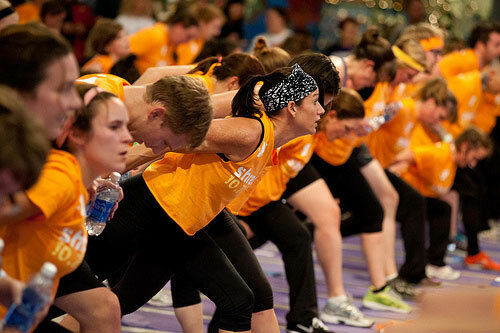 BodyShred is for all fitness levels and you only need to focus on YOUR intensity levels. Remember, your instructor will provide you with modifications during the preview period so that you can work at your own level. Your only goal is to push yourself to your maximum level of effort. A mat and dumbbells or resistance bands will be provided in the class. All you need is water, a sweat towel, and a great work ethic! Get ready to work. During the cardio intervals, your personal level of exertion should reach a “10” on a scale of one to 10 and shouldn’t fall below “7” during active recovery. Keeping up the intensity level is a key part of the class. Don’t give up. The whole idea of the class is to bring you away from your comfort area and toward a stronger you. It should be hard, and it will be uncomfortable at times. But if you keep pushing yourself and stick with the program, you will see results!